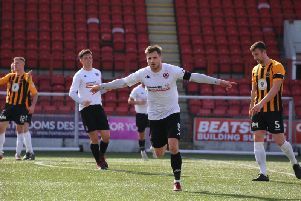 Clyde take a break from the Betfred Cup this weekend as they take their turn to sit out the action. The Bully Wee’s break in the five-team section comes neatly in the middle of their four fixtures. That will allow boss Danny Lennon to look at their first two matches against Edinburgh City on Saturday and Queen of the South on Tuesday night - and plan ahead to the games against Stranraer next Tuesday and Motherwell the following Saturday. He said: “We’ll come in and train and it gives us an opportunity to work on a few things. “We’ve now got the full squad back and it gives us a good opportunity to work on one or two things that are important at this stage. “It takes a few games to get your free flowing passing and your touch back, as well as trying to get the minutes in for fitness. That’s the frustrating thing about part-time football, it takes you a wee bit longer than others. While he is still looking to strengthen his squad, Lennon is delighted with his summer transfer business so far. He said: “We’ve got a group of players there with fantastic experience but who still have a lot to offer and want to go and achieve things.